WASHINGTON — Donald Trump, the conquering outsider, made his first trip Thursday to Washington to begin his transition as chief executive, offering the public its first glimpse of the culture clash in store when the 45th president assumes office. Ferried by his signature Boeing 757 emblazoned with his name, which departed New York’s La Guardia airport under a water cannon salute, the president-elect stepped within the hallowed walls of the Oval Office to meet for an hour and a half with President Obama. His wife, Melania, visited with first lady Michelle Obama in the White House residence. The billionaire real estate mogul — who for months has angrily pilloried Washington and its ways — muted his criticism and played a more subdued role, as if he were politely kicking the tires on a newly acquired property. He said he will prioritize cracking down on immigration, repealing Obama’s health care law, and creating jobs. But the day was much more about symbolism than substance. The White House released a transcript of the president’s and president-elect’s comments after they met Thursday. After calling Obama the founder of the Islamic State during the campaign, among other things, Trump said he looked forward to relying on Obama’s counsel in the future. Afterward, Trump traveled to Capitol Hill via motorcade for a lunchtime meeting with House Speaker Paul Ryan, and later a tete-a-tete with Senate majority leader Mitch McConnell, two GOP establishment figures with whom Trump has had a strained relations over the course of campaign. The string of private discussions, photo ops, and public platitudes about unity in many ways amounted to an introductory tour, both literal and figurative, for the incoming president, a political novice who is reportedly a little surprised to be embarking on this journey. On his trip from New York to the White House to Capitol Hill, he was a stranger in a strange land starting to get a sense of the new geography he will need to master in the months ahead if he hopes to be effective. 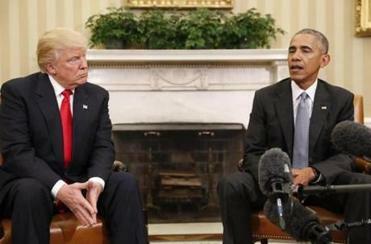 At the White House, Trump and Obama met for far longer than the 10-to-15-minute meet-and-greet originally planned, Trump said during brief remarks to reporters at the end of the sitdown. The former reality TV star noted it was the first time he and Obama, who called Trump unfit for office during the campaign, had ever met. Obama, in a blue-toned tie, and Trump in a red one, sat side by side for photos and put forth a common tone of rapprochement. It was a tableau deliberately designed, the White House said, to build public confidence in Obama’s commitment to guiding the government and the country through a smooth transition between their administrations. But the press, and images, were carefully controlled by both sides. The White House barred the press from observing Trump’s arrival at the South Portico of the White House, and limited images to the president and Trump sitting in the Oval Office. And Trump broke with tradition and excluded the press from traveling with him from New York to Washington, and in his motorcade, despite decades of protocol in which a press pool accompanies presidents and presidents-elect on all of their travels. Obama, who said as recently as Monday that Trump was temperamentally unfit to be president, said he was “very encouraged” by Trump’s interest in working with his administration during the next two months on key problems facing the country. “We now are going to do everything we can to help you succeed because if you succeed then the country succeeds,” Obama told his successor as the cameras rolled, before the two shook hands while seated in matching chairs. The pair even shared a jovial moment. As reporters shouted questions at the two men at the end of their remarks, Obama leaned over to his successor. “Here’s a good rule: Don’t answer their questions when they’re just shouting [them],” Obama said. “It’s always the last one,” Trump parried back. Trump and his transition team, led by embattled Governor Chris Christie of New Jersey, are furiously building an administration from scratch. With few ties to the political establishment and Washington’s network of think tanks, which have served many presidents as administrations in waiting, Trump faces a task in the two months ahead that is tougher than for most incoming commanders in chief. The work is being done both from Trump Tower in New York and an office building in Washington. One of the team’s most urgent tasks is finding candidates for the more than 4,000 presidential appointments Trump must make. Trump, the master of branding, already has a transition website named greatagain.gov, complete with a White House seal combining his name and the words “President Elect.” And, of course, there is a Twitter account, too. His official biography boasts of the real estate mogul’s quintessential “American success story” and brags about his real estate holdings from the Trump Tower skyscraper on Fifth Avenue to the Turnberry Golf Club in Scotland. The president-elect has said he would hand those real estate holdings and the rest of his business empire over to his children to run in a blind trust, instead of selling them or allowing an independent authority to oversee them, as ethics officials have recommended. But having his three eldest children manage Trump’s holdings through a blind trust does not preclude conflicts of interest. Donald Trump has said his children would continue to advise him, as they have on the campaign. One of his closest confidantes is his daughter Ivanka’s husband, Jared Kushner, rumored to be in contention for chief of staff. Speculation is feverish as for who will fill other key posts. Christie is reportedly being considered for attorney general, along with former New York mayor Rudy Giuliani, as well as former House speaker Newt Gingrich. Of course, it remains unclear if some of these controversial figures could surmount a filibuster if Senate Democrats decide to mount one. Gingrich’s name has also been floated for secretary of state, along with that of Senator Bob Corker, a Tennessee Republican and chairman of the Senate Foreign Relations Committee. Two of Trump’s former primary rivals, Louisiana Governor Bobby Jindal and retired neurosurgeon Ben Carson, are reportedly being considered for secretary of Health and Human Services. Senator Jeff Sessions, an Alabama Republican and early Trump supporter who stuck by him as other Washington Republicans distanced themselves following controversy after controversy, is reportedly being considered for secretary of defense. Trump’s arrival in Washington was the country’s first up-close look at a post-campaign Trump. His comments to reporters Thursday were the first public remarks he’s made since a conciliatory victory speech in the wee hours Wednesday morning. His meeting with Ryan, whom Trump called “very weak and ineffective” on Twitter last month, also produced mutual words of appreciation and unity. “I think we’re going to be doing some absolutely spectacular things for the American people,” Trump said. “We can’t get started fast enough, whether it’s health care or immigration — so many different things,” Trump continued, alluding to the widely expected move of the GOP-controlled Congress to seek a quick repeal of the president’s signature health care legislation. After meeting with McConnell, the Kentucky Republican who runs the Senate, Trump told reporters that he would prioritize immigration, health care, and job creation once he assumes office. “We’re looking at jobs, big-league jobs,” Trump said. When a reporter shouted a question about whether he would ask Congress to ban Muslims from entering the country, a position that helped propel Trump to national prominence, the president-elect abruptly said “Thank you,” and walked away.